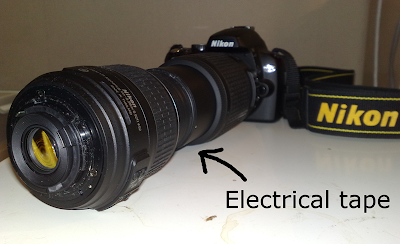 Do you own two or more lenses and want to try out some inexpensive macro photograhy? Good! In my last post I wrote about doing macro photograhy with cheap macro filters. This time I'll show you another inexpensive method of doing macro photograhy using a lens on your camera and a reversed lens in front of it. How to do this? You simply take a lens, reverse it and hold it in front of the lens on your camera. I used a Nikkor 18-55VR as the reversed lens and a Nikkor 55-200VR on the camera. 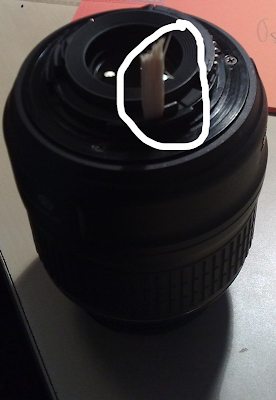 To hold the lenses together you can use for example electrical tape. Electrical tape is good because it doesn't leave any marks when you remove it. Instead of tape you could buy a reverse filter from Ebay. They are cheap, and are made for mounting stuff like lenses together. If you're not as lucky as me, and your lens hasn't got any manual switch, you will have to find some other way to set the aperture. One way could be to set the aperture while having the lens mounted on your camera, and then removing it with the camera still being turned on. But this is not something I have tried, it could damage your camera, and I don't recommend it. So try this at your own risk. Now you're ready to try out some, still inexpensive, but better macro photograhy. It's not a method as flexible as using macro filters, but the result you'll get is much better. 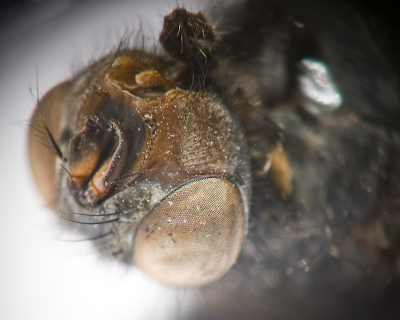 And the following is a picture I took of a (this time dead) fly. Click on it to get a bigger version! This method is cheaper than using a real macro lens. It's not as flexible as using macro filters (or a real macro lens), but the results is quite good. And as always, if you want better quality, you'd have to buy more expensive equipment. What do you do when you want to do macro photograhy, but don't have the budget to buy a proper macro lens? You buy a cheap macro filter kit from Ebay! A kit with 4 filters cost about 12$, and is a great way of trying out some macro photograhy. The result is of course not to be compared against using a real macro lens, but still OK for some experimenting at home. 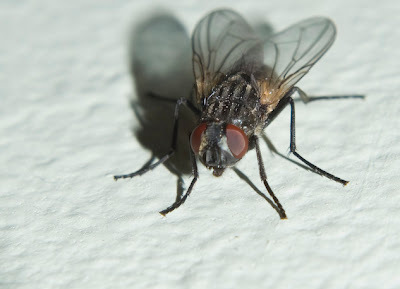 What you see here is a Musca domestica, or simply a housefly, which was sitting on the wall in my mothers house. The fly was probably meditating or something, because it was not moving that much. The picture is taken handheld using the pop-up flash, which, together with the cheap macro filters, also speak against a better quality of the picture.